A leaked promotional video for an iOS version of Google Now appeared on YouTube earlier today and was taken down within minutes. Luckily, Engadget was able to save the clip and was then able to re-post it on their website (see video below.) The video seems as legit as a video can possibly get, so if it is somehow a fake I will be incredibly surprised. 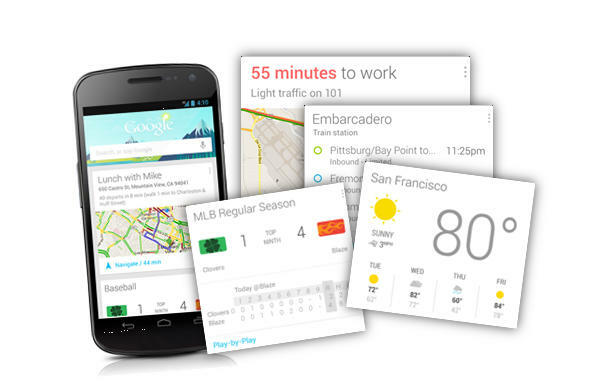 Google Now is an always-on and very smart service that is constantly updating depending on time and location. It allows users to simply swipe-down on their screen and automatically see things such as the weather, Google Calendar appointments, directions (these update depending on the time of day,) notifications for nearby events, and tons of other awesome information such as sports scores and boarding passes. Up to this point, Google Now has only been available on Android devices such as the Nexus 4,7 and 10 but there are tons of hints that it will be making its way onto Windows and iOS devices. The latest versions of Chrome OS should also be receiving Google Now since options in the about:flags area allow for Google Now to be enabled, but we are still waiting for the servers to become active. If (and more likely “when”) Google Now makes its way onto iOS, it will be accessible by swiping up in the Google Search application. The thing that makes Google Now so awesome is that is truly eliminates the need to physically search for tons of information, with its constantly updating servers, Google Now can do things like provide live scores for a basketball game if it senses you are near the arena, and can provide simple translations if it detects you are in a new country. From the looks of the ad, I think it is safe to say that Google Now will be coming to iOS within a month or two, if not sooner.